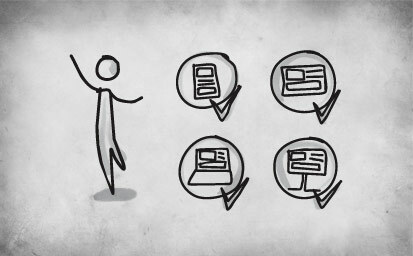 We've covered numerous topics and with this we are finalizing our Usability series. This is our conclusion, and we hope you've enjoyed the series. User testing, generally speaking, is a process during which an interviewer observes a user’s interaction with a product and, based on those observations, spots usability issues. Start by setting the goals that users should accomplish during the tests. These goals should be specific and measurable, should describe a complete activity and say what user should do, not how to do it. Based on these goals, design a scenario. This will consist of a number of steps, some of which will be crucial to the completion of the main task and some of which will be optional. Next, you should find participants. You can either do this yourself or you can hire an agency. Whichever way you go, you should realize that scheduling all the participants will not be an easy task. Depending on how important the environment of the testing will be and what kind of data you want to collect, determine whether the test sessions will be held at the users’ premises or at yours. During the session, your interaction with the user is crucial. It will determine the quantity and the quality of the feedback you can gather from that session. Always remember: you are trying to re-create a situation that the user would have encountered in their usual environment. You can collect comments on certain tasks, you can rate the tasks numerically or you can combine both approaches. There is a wide range of different factors you can measure. After every session is done and all the data has been collected and analysed, you should have a very good, clear picture of how users use your website and what the most striking usability issues are. User testing is not a one-time thing. Do the tests again after the known issues have been resolved. Looking for all the previous parts of this series? Here all the posts covering the following topics: Introduction to usability, Setting goals, Designing a test scenario, Finding and recruiting participants, Where should the tests be held, Interaction with the user (Part 1 and Part 2), Data collection, Contextual inquiry and final one you are just reading Conclusion.